My whole career has been built on relationships. I have worked in the real estate and mortgage industry for 25 years. After earning my Bachelors of Science degree from Missouri State University in Marketing/Finance, I started my career as a licensed Real Estate Agent. Upon moving to Texas, I worked as a Marketing Director for a large title company for six years. In this role, I began to understand the importance of communication and trust between a Realtor, a Mortgage Professional and the title company. Since then, I have helped hundreds of people achieve their dream of homeownership – and made hundreds of new friends. When I’m not helping people achieve the dream of homeownership, I spend as much time as I can with my Husband, Randall, and three adult children, Kacey, Zach, and Abbi entertaining family, friends and volunteering for my favorite Charities. – I love all kinds of sports and water activities. I am an especially HUGE fan of football and baseball – … GO Texans! Go Stros! My name is Leslie Maloney. I have worked in the mortgage industry for a little over 4 years. My unique approach assures everyone will feel comfortable going through the mortgage lending process. My reputation has been built on honest nature, personalized service and unwavering dedication to helping others experience the dream of home ownership. When I’m not helping people, I spend as much time as possible with my daughter, Payton. We love volunteering, baseball and spending time outdoors. Member Home Loan (MHL) has built a strong reputation as an outstanding mortgage lending firm, serving the lending needs of real estate professionals, builders and individual homebuyers. 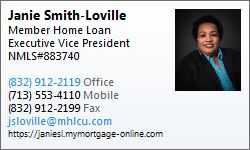 MHL is a credit union owned, full-service company with an experienced staff offering expertise in every area of mortgage lending, from purchase to refinance. Through our vast credit union partnerships, we also offer a multitude of “Out of the Box” portfolio products to meet your customer’s unique needs. We pride ourselves on customer service; our clients are the most important part of our business, and we work diligently to ensure their complete satisfaction. Julie loves helping people achieve their dream of homeownership. 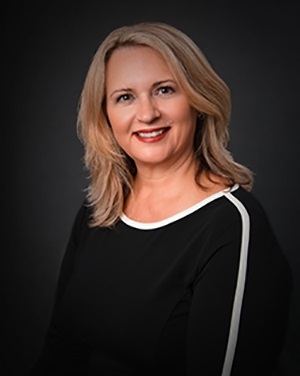 Her extensive experience includes eight years as a loan officer, eleven years as a mortgage broker and business owner, and more than twenty-five years in the Real Estate industry. Julie is a native Houstonian with a Bachelor of Arts in Mixed Media from the University of Houston. Let Julie put her comprehensive experience to work for you in making your dream of homeownership a reality. In her free time, Julie loves spending time with her daughter Emily. Emily is a sophomore at the University of Tulsa in Oklahoma. 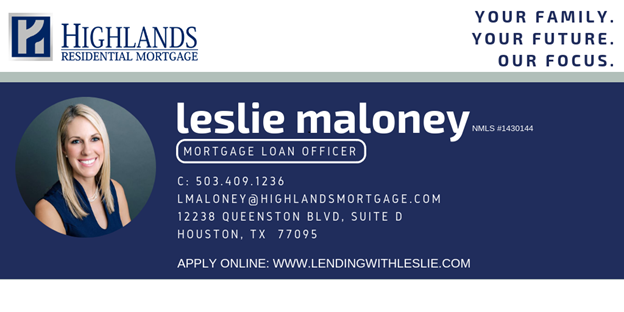 Kelly is a graduate of Texas A&M University and is very happy to be working with Member Home Loan in her hometown of Houston, TX. Having grown up in the Cypress area, she considers it an honor to be working with the community and making an impact in homeownership. Kelly is fully licensed in the states of Texas, Ohio, Missouri, New Mexico, and Oklahoma; she looks forward to helping people achieve their dreams of homeownership both near and far. Diana was born in Chicago, Illinois but has been a Texan for over thirty years now and she is a licensed loan officer in the state of Texas. She has been serving the local community with their financing needs for over a decade specializing in all loan types ranging from car loans to mortgage loan and everything in between. 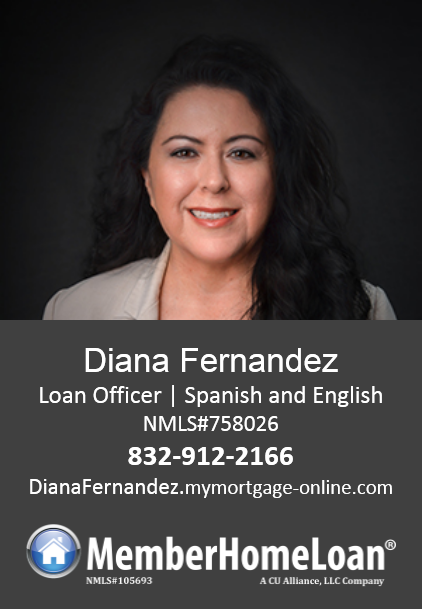 Diana is honored to be able to assist you with your home buying journey and finding you a place to call home or make your current home loan work better for you. Shomari is originally from Dayton, Texas, and a former Fort Bend ISD educator for thirteen years. He’s also earned a Bachelor’s degree from Lamar University and a Master’s Degree from Texas Southern University. 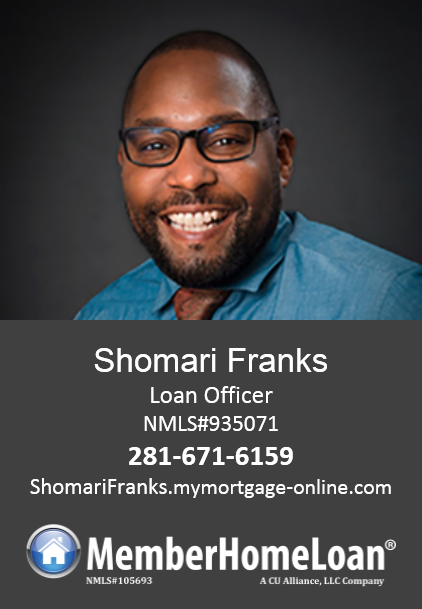 Shomari is currently licensed as a Mortgage Loan Officer in five states: Texas, Illinois, Louisiana, Oklahoma, and Missouri. As a loan officer, Shomari believes in patiently guiding his borrowers through the loan process while educating them along the way. He truly understands that buying a home can be exciting and scary at the same time; “Just have to trust the process,” he often says. Lauren has a Bachelor’s Degree from the University of Houston with an emphasis in accounting. Lauren has worked as an income auditor, payroll administrator and account receivables agent. She has a wealth of experience working with numbers, providing accurate information and has outstanding customer service. Before Lauren became a loan officer, she worked as a transaction coordinator and Realtor’s assistant, which gives her clients a distinct advantage to a seamless transaction. Lauren is dedicated to helping her customers choose the correct loan program to fit their financial needs. 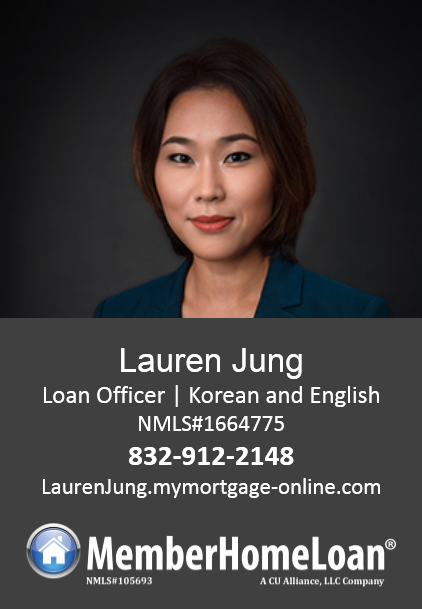 Lauren strives to ensure her homebuyers are comfortable with the loan process, whether it is buying their first home or refinancing an existing home. Lauren is fluent in both English and Korean. Carly grew up in Northwest Houston, and she’s delighted to be back in the area helping her community achieve the dream of homeownership. She came to Member Home Loan with experience on both sides of the Real Estate transaction as well as many years of originating loans for new construction builders and resale homes alike. 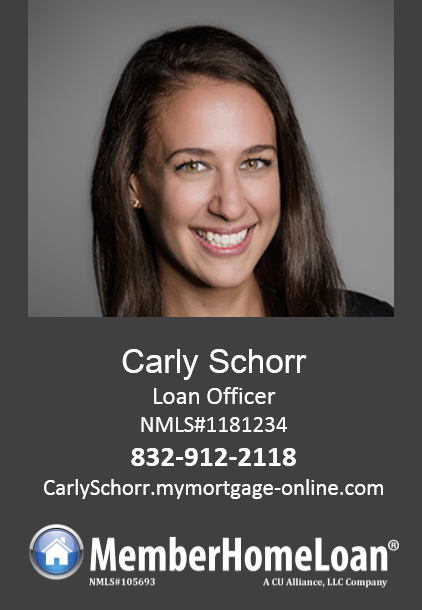 Carly works hard so that everyone she works with feels confident during their home buying or refinance process which is why she makes communication a priority. 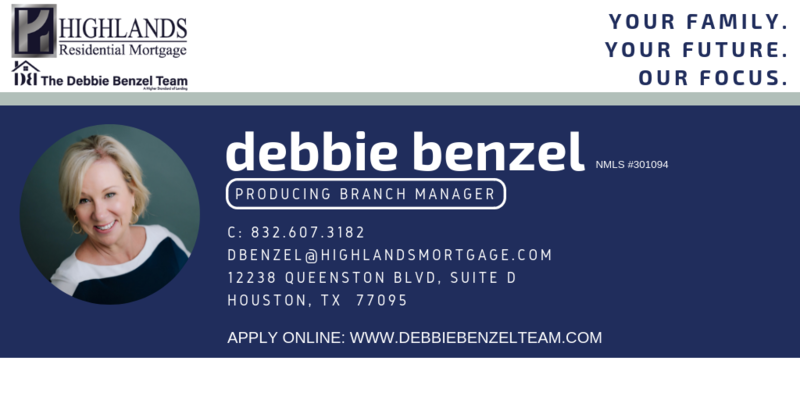 When she’s not closing loans, you can find her at one of Houston’s many parks with her son and golden retriever or catching some live music or food trucks around the loop.